Have done the EGR cooler bypass and EGR delete via software this weekend. Now I need to monitor if this has fixed the problem. Fingers crossed. Hope your headaches is gone. What is the performance like after the mapping was done? So far so good, have noticed a change in the way the exhaust fumes smell as well - doesnt have the hint of coolant smell any longer - I hope this isnt just my mind playing games on me'. Anyway have to drive for atleast 1000kms to know that i've had some success, its only been about 300kms thus far. seeing as i was going to get the software and the downpipe done I was interested to see what gains would be had. 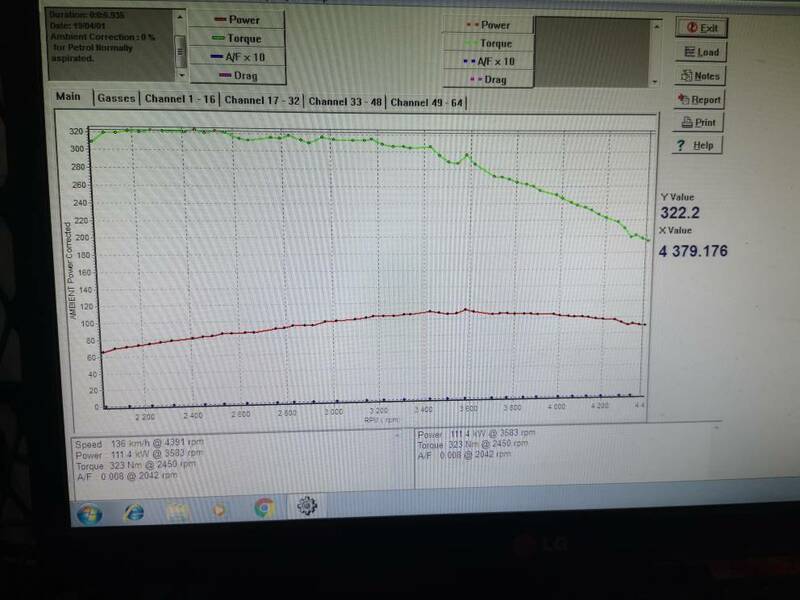 I had a stock dyno run so i could guage the increase as well as power delivery. Car is rate at 110kw from factory so either this Dyno is reading at the fly, or VW have their figures under quoted. Made 110kw at Rally Cross Motors in Durban - which I think is a wheel power dyno??? Will do another run after the pipe is in and i'm certain that the coolant problem has been fixed. seems i got the picture posting wrong - is there any special trick to it ? yes. Either tapatalk apparently or host on a server somewhere . post the link between the square bracket img] post link here [imgsquare bracket\ thing that you get when you click the picture thingy you get when you go to the advanced post thing. Definitely looks like fly power. looking forward to seeing the after graph. Need to start the run at 1500 rpm not 2000. no good on diesels as you can't see the initial torque rise. Thanks panic, will mention that the next time I go. Which gear should the run be in? Don't know what gearbox, but 3 for a 5 speed, 4th for a six speed and 5 for a 7 speed. But gear makes no difference if the engine is loading ok.